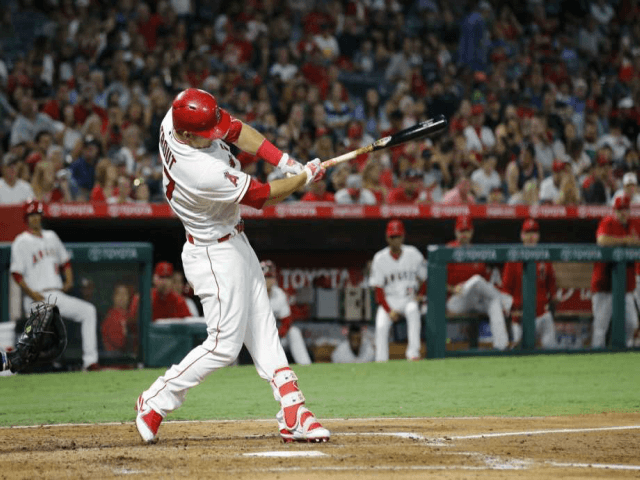 ANAHEIM, Calif. (AP) — Mike Trout got his 1,000th career hit and also homered on his 26th birthday Monday night. The Los Angeles Angels’ two-time AL MVP hit the first milestone when he doubled down the left-field line in the fourth inning against Dylan Bundy and the Baltimore Orioles. Trout then added his 23rd homer of the season in the sixth, driving it high off the left-field pole. The slugger homered on his birthday for the fourth time already in his six-year career, also doing it in 2012, 2013 and 2015. Trout joined Mel Ott, Jimmie Foxx and and Mickey Mantle as the only players to compile 1,000 hits, 500 runs and 500 walks by their age-25 season. Trout already was the only player to get 150 homers, 400 extra-base hits and 150 stolen bases before his 26th birthday. He is the 11th player to get 1,000 hits in an Angels uniform. The Big A crowd sang “Happy Birthday” to Trout in center field earlier in the inning. The fans gave him a standing ovation after his 1,000th hit.